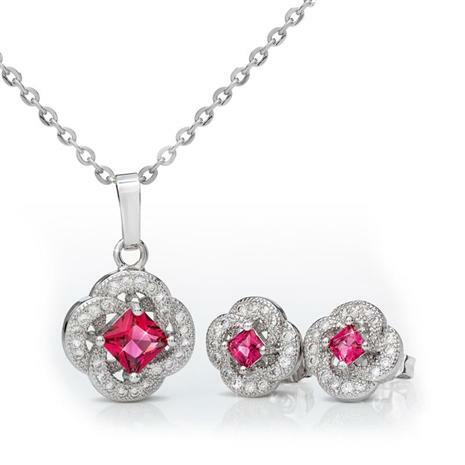 You can thank science for the arresting red in our Red Clover Necklace & Earrings. The rich crimson color of our lab-created DiamondAura® stones share a depth and clarity that easily compares to $5,000 per carat rubies. But the good news is that you won’t even come close to spending that on these pieces. The cushion cut center ruby red stones are surrounded by sparkling white DiamondAura stones in a lucky four-leaf-clover design. 18K white gold-finished settings. 1 ⅘ carat total weight.